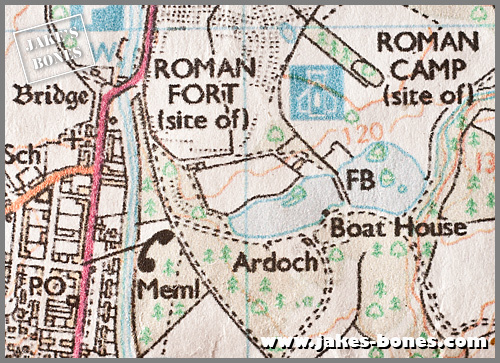 You are here: Jake's Bones > Where did Ardoch House go ? 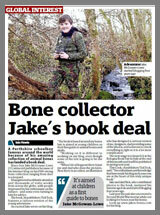 This is the story not about bones but about looking for an old historical building near my village. It began with an email I got in April. 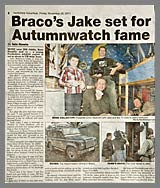 It was from a man called David Forbes who lives in Canada but who used to have relatives in Braco which is the village where I live. 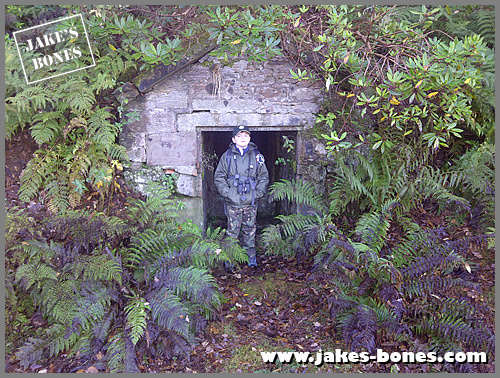 He emailed me because he found my blog post about the ice houses on the Ardoch Estate. 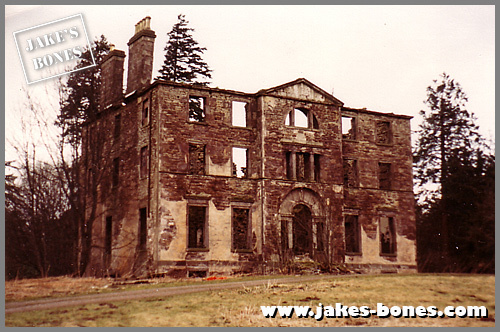 He told me that he used to have a relative who was a housemaid at Ardoch House over 100 years ago, and that when he came to Scotland in 1984 he visited the old Ardoch House which was now derelict. But he visited again in 1989 and it wasn't there any more ! This looked like an amazing building and I wanted to find out more about it. I knew roughly where it might have been on the old estate because I do a lot of walking there. First of all I looked on my 1:25,000 Ordnance Survey map from 2009, but the house wasn't shown. 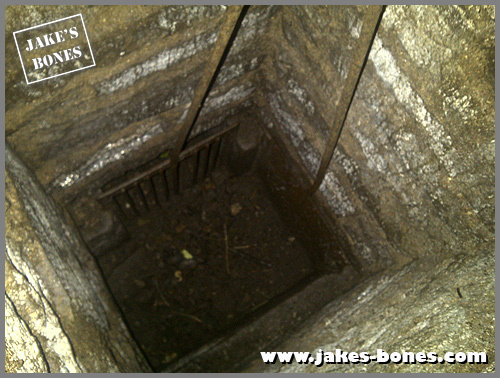 When we went to look for the site we met the gamekeeper's wife who told me that the drains were still on the site. This was one covered by a huge stone. This looked like the site but was it the right one ? Dad and I had taken the picture that Mr Forbes had sent. In his picture (the red one below) were three big trees and you could see these three big trees now. You could use those trees to stand on the same spot that Mr Forbes stood to take the photographs. This is what it looks like if you put his picture from 1984 over my picture from 2012. It was a match and this must have been the site ! 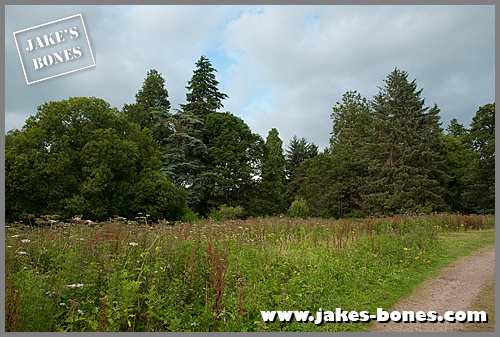 The site was overgrown and full of weeds and pheasants. 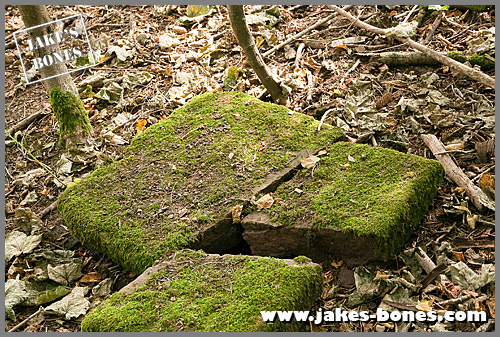 There was some rubble but not enough for a house. So where did the house go between 1983 when this photo was taken, and 1989 when it wasn't there any more ? I knew some of the other parts of the estate because I have been walking there for years. There are two ice house that I have written about before. This is the west one which is quite deep. Ice houses were used as big freezers before freezers were invented. Ice would be taken from a loch and stored there together with food like meat which would otherwise go off. 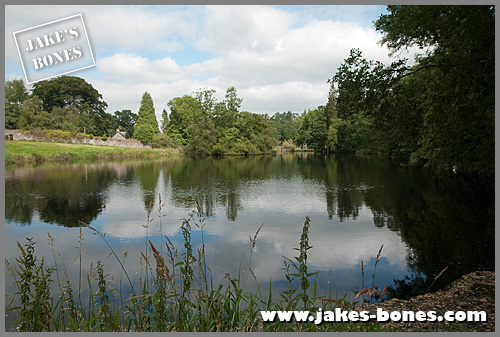 These were the ponds next to the ice houses. 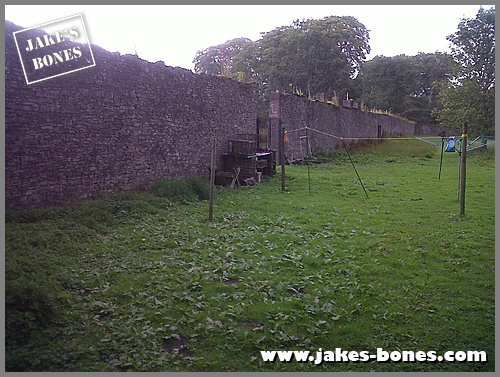 On the left side of the picture above you can see the walled garden which is on the opposite house to Ardoch House. The wall even had chimneys in where gas or coal was burned to keep the wall warm so special plants could grow in cold weather. 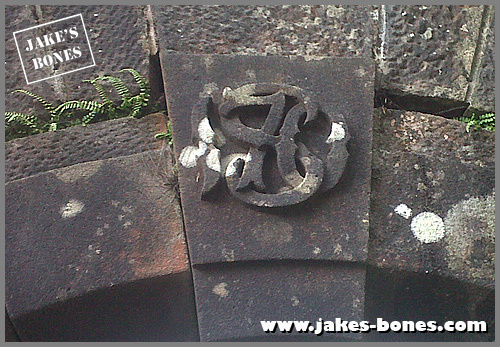 This is the inscription on the keystone of the arch into the walled garden. It says either 1780 or 1870. It's probably 1780 because the wall can be seen on the 1868 map. This is next to the walled garden. It is called the gardeners cottage even though the gamekeeper lives there now. This is the old way into Ardoch House. The road came from Braco over the river Knaik and over the field. The bridge has fallen down now. 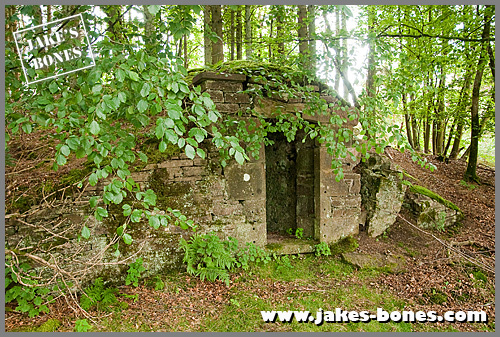 This is the old gatehouse to Ardoch House which is still there but it is derelict now. It is called the South Lodge and is on the Buildings at Risk Register. I found some things out about the owners as well from looking on the internet. 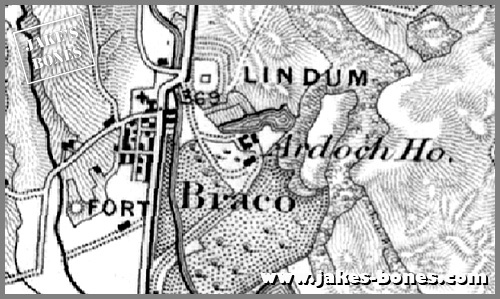 Prior to 1690: there was a house called Ardoch House in which Roman relics were kept after they were discovered in the Roman tunnel. In 1715 the house was looted by Argyll's soldiers and the relics stolen according to this. In 1720 the house was rented for 40 years while Sir William Stirling was fighting in Russia for the Czar's army. The tenant covered the mouth of the roman tunnel with a millstone. Was the new house built in 1795 ? The National Archives of Scotland have "Policy of insurance against fire issued by the Edinburgh Friendly Insurance to Sir William Stirling of Ardoch, bt., for his mansion house of Ardoch, newly built" listed here. In 1816 the stables were built. In 1826 there was an additional bit was built according to RCAHMS. This seems to be another bit added to the stables and they were designed by William Stirling. 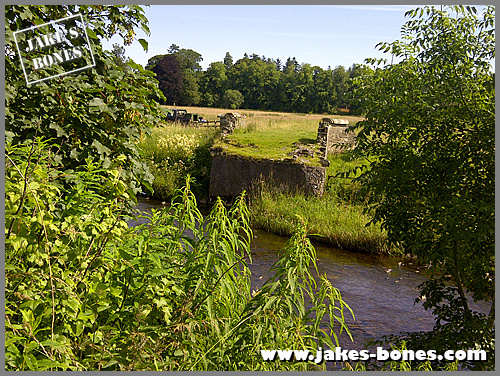 In 1834 it was owned by Major Moray Stirling according to An Account of the Principal Pleasure Tours in Scotland. In 1840 The Sporting magazine said there was a fox hunt near the place. In 1842 an archway was built by Major Moray Stirling for a visit by Queen Victoria. In 1851 there was a murder ! "Isabella Skinner, widow, Age: 18, servant to George Home Drummond, Esquire of Ardoch, of ArdochHouse, Muthill, Perth, Address: Residing with Janet McIntosh or Mearns, widow and lodging housekeeper, Skinnergate, Perth" was accused of the culpable homicide of "James Monteath, near Braco, Muthill parish, Perthshire...in or near Ardoch House, Muthill, Perthshire" according to this. She was found not guilty according to this. In 1854 and 1867 and 1876 it was owned by George Home Drummond (1813-1876). I found this out about him from here: "George Stirling Home Drummond, of Blair-Drummond, and Ardoch, b. on 1 March, 1813, and succeeded to these lands. He m. firstly on 11 August, 1840, Mary, daughter of William Hay, of Drumelzier and Duns (she d. in 1855), and secondly at Haddington on 7 May, 1863, to Kalitza, daughter of Robert Hay, of Linplum (she d. in 1876). He dsp on 3 June, 1876." I found this out about him from here: "Charles Stirling Home Drummond Moray, b. on 17 April, 1816, and succeeded to the lands of Abercairney in 1864 and also to those of Blair-Drummond, Ardoch, Millearn and Douglas House on the death of his elder brother in 1876. He m. on 11 December, 1845, to Anne Georgina daughter of William Douglas, 5th Marquess of Queensberry and d. on 24 September, 1891." By 1964: (Added in June 2014) I go an email from Jeremy Price who wrote: "I read your piece about Ardoch House while researching my former home, Little Ardoch, in Braco. I'm expecting to re-visit Scotland later this year after an absence of 50 years. My father, John Price, was General Manager of Kier and Cawder Estates which with Ardoch Estate was owned by Col. William (Bill) Stirling at the time. I was free to roam over the estate provided that I behaved myself and didn't upset the gamekeeper. I recall that the cellars at the rear of derelict Ardoch House were used as an enormous silage pit; I remember the ice-house next to the lake where I was allowed to use the dinghy to fish in the long summer evenings provided the laird didn't want to use it. Old Tom McNaughton was the gamekeeper before he retired early in the 60's. Also, I remember the Forbes family children Ronnie and Wendy and an older brother who studied Medicine at the time. I'm not sure if that is the same Forbes family to which you refer. 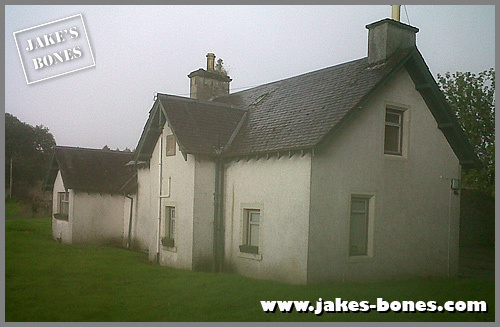 Anyway, Ardoch House was standing in 1964 and being put to agricultural use." In 1984 the house was derelict. In 1989 the house wasn't there any more. 1901 Census for Ardoch: Ardoch Mansion House - Rooms with one or more window: 43. Janet Forbes, servant, single, 45, caretaker and laundrymaid, worker. 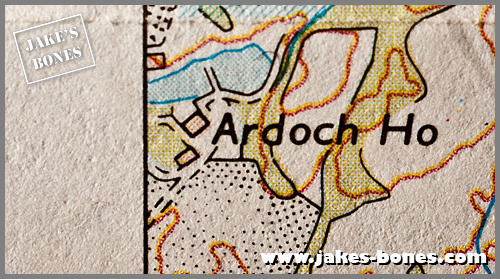 born Ardoch, Perthsire. Christina Cameron, servant, single, 22, laundrymaid, born Rannoch, Perthshire. Also in the census are listings for Ardoch North Lodge, gardener's cottage, butler's cottage, overseer's house, coachman's house, keeper's bothy and keeper's house. He also said: "My grandmother remembered a beautiful dark blue mosaic tile fish pond near the entrance to the gatehouse, and sure enough it was still there but in disrepair. " I don't know where the fish pond is now. I was going to write more about the old photographs of Ardoch House I found at the RCHAMS archives in Edinburgh, but I need to get special permission to show them on the blog first, and I might have to pay them money as well, and I haven't had time to sort that out this week. 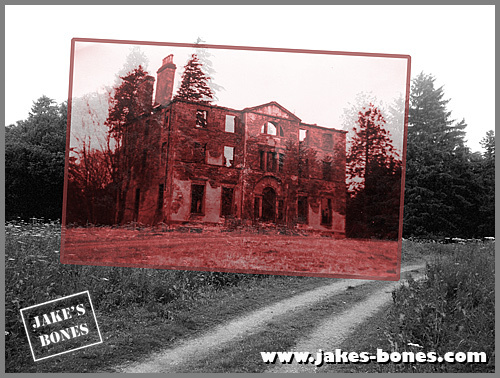 I am also going to write more about how I found out where Ardoch House went. 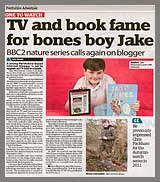 UPDATE: I have written about it and it is here ! 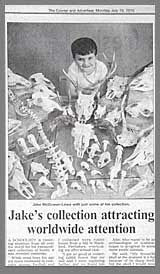 Next week I am going to write more about the archeological bones. brilliant post Jake, you'd make a good detective. It must be great to live somewhere so fascinating. How interesting! I used to live in a house that was part of an estate and the big country house was just a shell. We weren't supposed to go as it was private property but we couldn't resist as it was so fascinating. 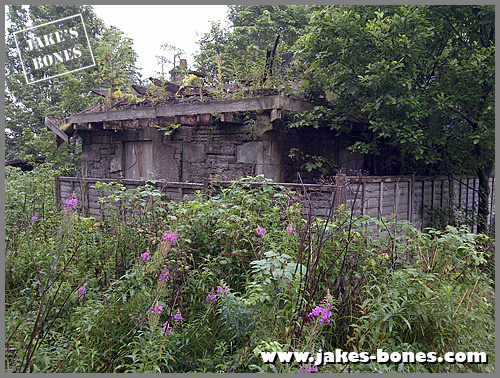 There was an overgrown garden and a stable block too. I hope you continue to enjoy your research. 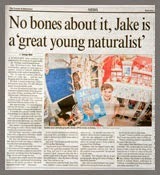 This is fascinating Jake! You have done some really clever detective work and explained it all so well. You could be a historian! 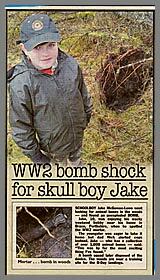 What a great site Jake...you are a born historian and archaeologist. I have been doing geneology for many years and am presently working on the Bontein family, particularly the family of Thomas Bontein (1757-1822) and his brother Archibald Bontein. Both were early settlers in Jamaica West Indies in the days when British colonialism was taking root there. Apparently Ardoch estate was long possessed by the Bontein family and disposed of by Nicholas Bontein to his cousin Robert Graham of Gartmore. 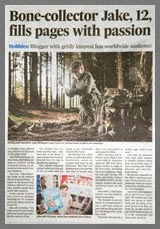 (see Annals of Gareloch on www.electricscotland.com) When this may have occurred I have not yet discovered. In any case Archibald Bontein was a mapmaker and tunnel builder (sapper) during the Napoleonic era and made some of the earliest maps of Port Royal Jamaica. His brother Thomas was a plantation manager for a group of London investors. He was also awarded contracts by the British government to find, purchase and and " enlist" black slaves into the British military in the time before Britain abolished slavery and at a time when Britain used slave men to supplement their military. Sort of shocking nowadays but the first lesson of history is that you cannot judge the actions of others by the norms of your own time. Keep up the great work...your site is grand. I was very impressed with your research. Charles S H Drummond Moray was my great great grandfather. 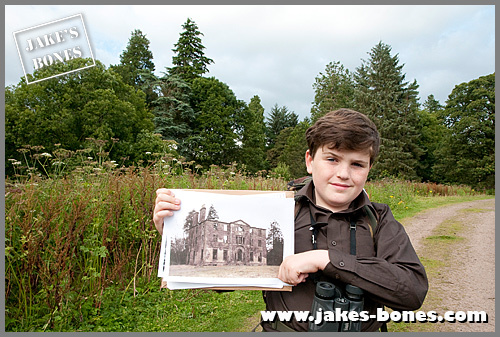 He actually lived at Blair Drummond that is why he is not included in the census for Ardoch. I did not know most of the dates that you found out so I am very grateful. I live in Australia and have been to Scotland 3 times but never to Braco. You are a very talented young man. Thanks ! It must be amazing to trace your family like that. Hello! I'm trying to figure out if my Great Great Grandfather Donald MacAlpine was the gamekeeper at Ardoch Estate. I have him living in the 'gamekeepers house', Ardoch in the 1911 census - but that seems to be all the information I can find. I'm really trying to trace one of his sons but this seems to be a good place to start. Do you have any info that would confirm his name? Thanks! My Great Great grandfather Kenneth MacKenzie is recorded as being a blacksmith here in the 1861 Census, and my Great Grandfather Kenneth Burnet(t) was visiting at the time. 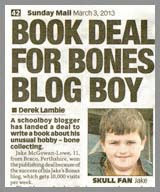 What a wonderful place it must have been for a 5 year old Crofters son.